AGT’s Season 8 winner performs to “Changing” on America’s Got Talent: The Champions. 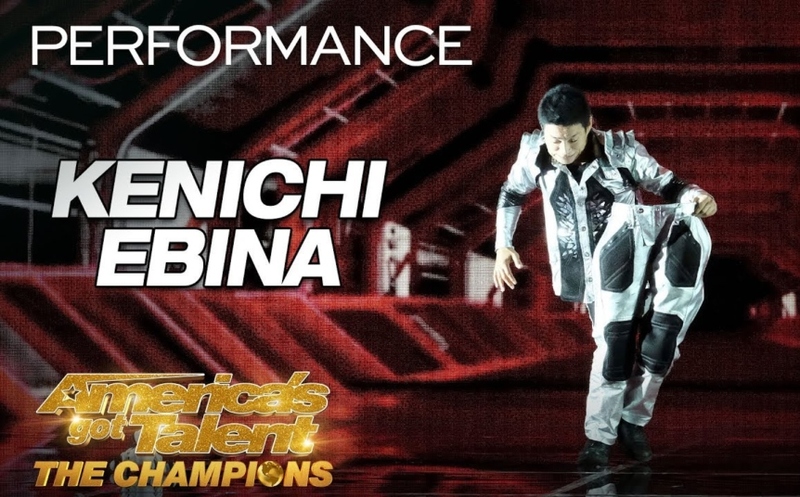 Back in Season 8 of “America’s Got Talent,” visual dance artist Kenichi Ebina became the first (and so far only) dance act to win the million dollar prize. Now that he’s returned in “America’s Got Talent: The Champions,” NBC’s spinoff series that pits 50 acts from around the world against each other, he tried to do the unthinkable and win twice. Kenichi’s latest act was inspired by video games, as he fought against a gigantic robot monster while doing crazy dance moves. At one point his head appeared to dislodge from his body, while at another moment his legs seemed to separate themselves. The audience was on its feet with excitement. Simon Cowell said: “I always, always, always loved you. That was original and to have you back is fantastic. The more we see you, the more we liked you. Well done.” Unfortunately, Kenichi was eliminated prior to advancing to the Finals. Kenichi Ebina is a solo self-taught dance performer, started out dancing Freestyle HipHop and expanding his style to Poppin’, Lockin’, Mime, House, Jazz, Contemporary and Ethnic dance. In 2001, Kenichi founded a dance group with all Japanese dancers, BiTriP. BiTriP won in the final grand championship of “Amateur Night” at the world famous Apollo Theater in 2001 as the first Japanese performer. In 2007, Kenichi appeared on dance contest of “Showtime at the Apollo” as a solo performer and became the grand champion of 2007 season after winning 7 times. Kenichi is the only two-time grand champion in the Apollo theater history. Kenichi has been performing at many events, TV shows and teaching in the United States, Europe, Russia, China, Korea, Singapore, Japan, Morocco and Australia. Kenichi has also performed, directed and choreographed for many projects and dance and theater companies. Ebina Performing Arts’s first full-length show premiered at USA’s national Kennedy Center for the Performing Arts. Also, Kenichi was invited as a speaker to TED 2007. Kenichi has appeared on the show, PBS Kids “Angelina Ballerina” as a featured dance performer. Occasionally he has been performing for high class show club, “The BOX” in NYC and London, and “The ACT” in Las Vegas. Ebina has made many public and private appearances. Ebina’s performances are high-tech, aesthetic ideas realized; from a videogame landscape with high-definition graphics that highlights the interplay between Kenichi and the backdrop screen, to a Michael Jackson tribute that replicates the effortlessness in some of Jackson’s most difficult, iconic moves, Ebina’s art is a fine-tuned, multimedia theatrical experience. With his vast sensibility of movement, motion and current trends, Ebina contorts his body to changing tempos, choreographing themes and weaving concepts into flexible feats of strength that work as segmented performances, or as a show up to twenty minutes in length.